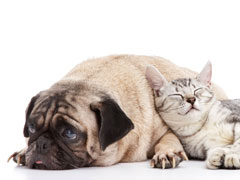 We offer a unique "team approach" to veterinary dental care. Two heads as a team are better than one. We diagnose first, communicate with pet owners and develop the best treatment plan for pets and their owners. We call this "COHAT" meaning Complete Oral Health Assessment with Treatment planning. Pet owners decide on the optimal care for their pets. We offer our recommendations based on long-term experience. Together with owners, optimal care can be provided. This is truly a team approach to dental care.